Weightless all day hold and shine. A superb gel that interacts with each individual hair strand to add volume. Weightless -- All day hold and shine. 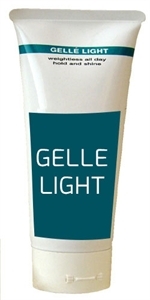 A superb gel that interacts with each individual hair strand to add volume, body and shine. Perfect for any hair type. It's especially effective for men and women with fine, thin and thinning hair. Formulated with our exclusive Volu-Plex, a blend of purifying botanical's, designed to help maintain a health environment for continued hair growth. More than a styling tool, it is a scalp revitalizer. Vitamins A and E soothe the hair. Panthenol and Soy Protein providing extra conditioning as they increase hair's diameter, leaving hair looking fuller and more manageable. This alcohol-free formula will not flake or build-up over time.